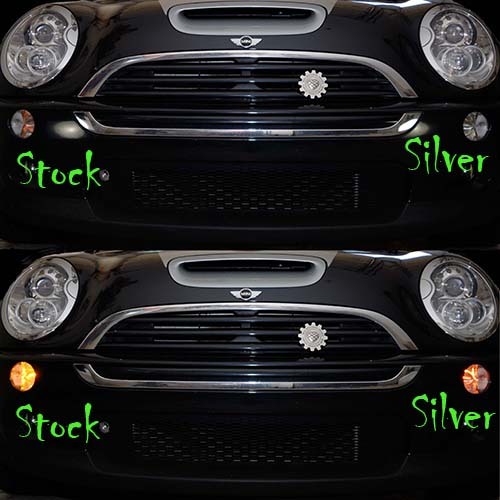 Silver Front Turn Signal bulbs for your 2002-2006 R50 R53 MINI Cooper, and 2005-2008 R52 MINI Cabrio. No more ugly orange egg yolk look in your clear corners. Simplest and coolest exterior mod. These silver turn signal bulb appear silver or clear when installed, but when they flash they still flash amber so they are still street legal. 2000 compared to 1000 for standard OEM bulbs. All Stealth Bulbs™ are backed with our unconditional Satisfaction AND Lifetime Guarantee so shop with confidence. You are purchasing the best longest lasting coated signal bulbs on the market today! Thats our car above. Love the look of the silver bulbs. Had them for several years and no issues to report. Love the Stealth bulbs. They give a much cleaner look than the OEM amber bulbs and they were very easy to swap out.